1 A - On the Apps screen, tap Private mode of Settings. 1.B - Alternatively, open the notifications panel or the quick setting panel, and tap Private mode to activate it. 2 Read the on-screen information and tap Next. 3 View the type of content that can be saved in private mode and tap Next. 4 Read the on-screen information about using private mode and tap Start. 5 Set an unlock code and backup PIN. When this mode is activated, : this private mode icon appears on indicator bar. 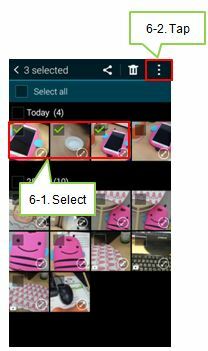 6 While Private mode is enabled, select items you want to mark as Private – in this example we will. 7 Tap the more button and select Move to Private. These items will now be hidden when Private mode is disabled. On Hidden images set to “Private Mode”, private mode icons is “added”. When you have selected the items to hide, on the Apps screen, tap Settings → Private mode, and then drag the Private mode switch to the left. Alternatively, open the quick setting panel and tap Private mode to deactivate it. The selected items will disappear from the screen. 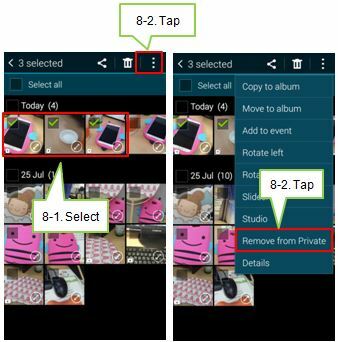 8 To remove an item from Private mode*, first select the items you want to remove from private mode. Then, tap the more button and select Remove from Private. The selected items will no longer be secured or hidden. 9 To view hidden items*, on the Apps screen, tap My Files. If you select Private directory, all items added in private mode appear on the screen. 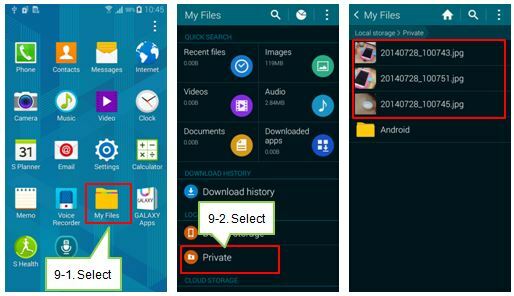 How do I remove a registered fingerprint in Galaxy Alpha? Galaxy S9/S9+: What do I have to do when Iris scan do not work properly? Galaxy S9/S9+: Is there harm if we use the IR for Iris authetication?